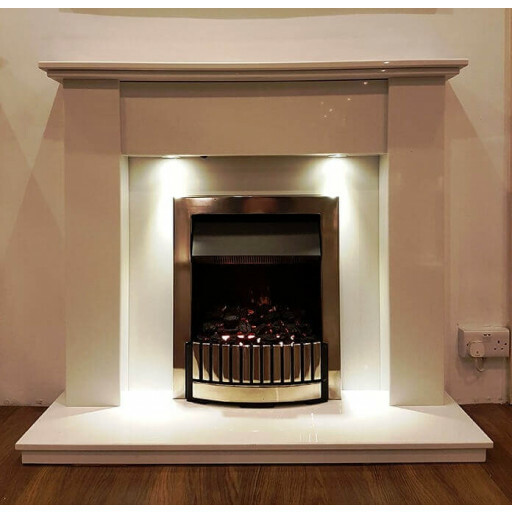 The Kanton marble fireplace with lights is guaranteed to bring beauty and warmth into your home, wherever it is positioned. The marble used to construct this chic and modern fireplace has a luxurious appearance that never goes out of style, yet is durable enough to last for generations. The Kanton marble fireplace with lights is also very easy to clean and maintain using just a damp cloth to keep it looking spotless. Because marble is such a hard and dense stone choice, it is a natural choice for a handsome fireplace because not only is it heat resistant, it is also resistant to water. We wanted a nice simple surround and saw the Kanton fireplace. It was brilliant value for money and the visit to the showroom was a very nice experience. Fab simple surround in a crisp white marble. Just what I wanted. Took my parents into the Fireplace warehouse and was greeted by a lovely, smiling lady at reception. I explained that my parents wanted a small, marble fireplace and she got someone on the phone to come and help us. John kindly showed us round the store, and boy what a choice. and was patient and explained the benefits of each fireplace with great knowledge. My parents decided on the KANTON fireplace and it was in stock, so we were able to get it delivered very quickly. I can't comment on the fitting as a family friend fitted it for us but everything else was spot on! We went to the Stockport branch looking for a simple surround and fire. we were recommended the Kanton by the lovely sales lady. We took her advise and went for it. It looks absolutely amazing and we got a free fire threw in as well. All for under our budget. Beautiful marble fireplace for a good price and excellent service. Beautiful marble fireplace and we could not believe the price!! Excellent service in store and professional fitting service,we love it ! !